May Day was officially founded in 1886, during a Chicago strike for the eight-hour workday. In 1889, the American Federation of Labor (AFL) delegate to the International Labor Congress in Paris proposed May 1 as international Labor Day. Workers were to march for an eight-hour day, democracy and the right of workers to organize. 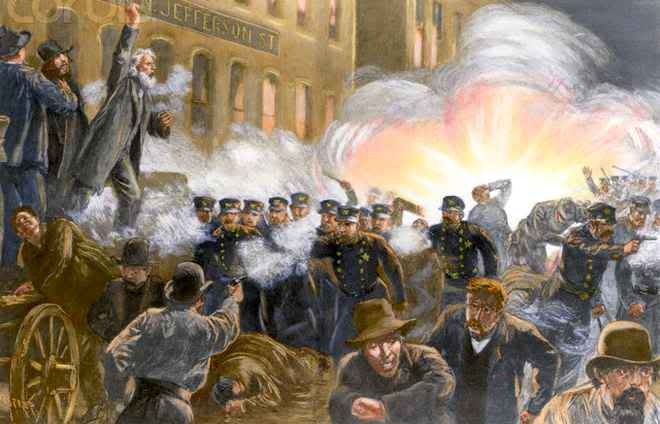 Delegates approved the request and chose May 1, 1890, as a day of demonstrations in favor of the eight-hour day. Although some employers did meet the deadline, many did not. Accordingly, great demonstrations took place on May 1 all across the country. Chicago’s was the biggest with an estimated 80,000 marching on Michigan Avenue, much to the alarm of Chicago’s business leaders and newspapers who saw it as foreshadowing “revolution,” and demanded a police crackdown. In fact, the Anarchists and other political radicals in Chicago were reluctant to have anything to do with the 8-hour day strike, which they saw as “reformist;” but they were prevailed upon by the unionists to participate because Albert Parsons and others were such powerful orators and had a substantial following. Albert Parsons and seven others associated with radical organizations were prosecuted in a show trial. None were linked to the unknown bomb thrower, and some were not even present at the time. They were held to be responsible for the bomb thrower’s act, because their public criticism of corporate America, the political structure, and the use of police power against the working people, was alleged to have inspired the bomber.